In this tutorial, I am using the work of Ismael Rac. You can purchase the Yummy Naughty Valentine tube & the kit at his site here. Please make sure you have a license to use his work. You can also get a license at his site. For this tutorial, I will use C/P for Copy/Paste. Please use my tag as a reference as to where to place elements. Remove copyright layer & merge visible. C/P your tube of choice. If you are using the same tube as I am, resize to 75%. C/P LOVE word art. Place at bottom of canvas. C/P martini & resize to 30%. C/P lovecuppy & resize to 20%. C/P stawberry & resize to 30%. Duplicate 5 times & place your duplicates around your canvas. C/P heartpop & resize to 20%. C/P cuffs & resize 30%. If you want to add a name to the tag, follow the directions below. Font: Love Letters, you can get it here at dafont's website. I hope you enjoyed my tutorial. I'd love to see your work! Please submit your work to me at agelesskarmacreations@gmail.com. I am using the awesome work of Elias Chatzoudis. You can purchase his work here. Please make sure you have a license to use his work. 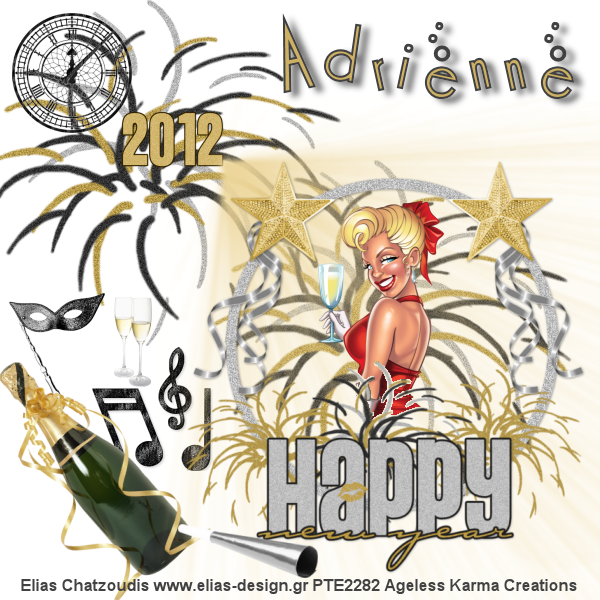 The kit I am using is called New Years Celebrations & was made by Purple Kreationz. You can get it from her website here. Thank you so much Purple for sharing your work. C/P PK-NYC-F1 & resize to 70%. C/P your tube of choice inside the frame. Position to your liking. If you are using the same tube that I am... resize to 50%. C/P PK-NYC-CLOCK1 & resize to 30%. C/P PK-NYC-FIREWORK & drag to bottom layer & place behind frame. C/P PK-NYC-LIGHTRAY2 & resize to 30%. C/P PK-NYC-2012-2 & resize to 30%. C/P PK-NYC-CHAMPAGNE & resize to 60%. C/P PK-NYC-MASK2 & resize to 30%. C/P PK-NYC-GLASSES & resize to 30%. C/P PK-NYC-MUSICNOTES3 & resize to 30%. Place this layer below the champagne layer. Add the Copyright & your Watermark. I hope you enjoyed making this tag as much as I did. I am using the awesome work of Ismael Rac. 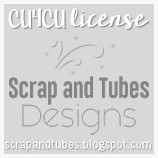 You can purchase the tube & kit at his website here. We will open a 600 x 600 transparent canvas. The first C/P Snow element. Next, C/P Frame & resized to 50%. Next, use your magic wand & click inside the frame. Next, C/P your SexyDeerHD02 tube & resize to 40%. Next, select SELECTIONS, INVERT, DELETE on keyboard, SELECTIONS, SELECT NONE. Next, C/P tree2 & resize to 30%. Next, C/P presents & resize to 30%. Next, C/P bow & resize to 30%. Next C/P candles & resize to 30%. Next add your Copywrite & Don't for get to add your Watermark. You can use a Font of your choice. Hope you enjoyed doing this tutorial.